I have been listening to this podcast since Stitcher first recommended it to me on my new iPad 2, so yeah, it's been a while. I really like the new format, especially the after-show. The topics are relevant, timely, and smartly discussed, challenged, and corrected if necessary. If you like 99% Invisible or This Week in Tech or the Economist, you should listen to this podcast. Thanks. A great weekly conversation about technology, the geeks do not dumb it down or talk in technobabble. My favorite thing about geekspeak is that opinions are expressed as opinion not fact. I’ve been listening for about 2 years now - haven’t missed one. Everyone on this podcast is intelligent, conscientious, engaging, and thoughtful. I think the reason I love it so much is the fact that in addition to the deliciously nerdy discussion of tech topics (at just the right depth for a technically-oriented person who isn’t necessarily an expert in a given topic), the Geeks get into fascinating conversations about political and ethical issues surrounding technology. I’m especially a fan of the Geeks’ coverage of privacy challenges, and have found that the show has helped me formulate many of my own positions on the issue. I’m sad to hear that KUSP will likely shut down, but I’m looking forward to the continuation of the podcast. Thanks guys! i am so glad to have discovered GeekSpeak on KUSP when i moved to santa cruz last year, and am now catching up on the catalog by podcast. it’s a dream class on technology and society that is led by folks who have a close-up view of what’s happening in silicon valley. i love that there are explanations of technical developments, together with discussions of what this means for society at large. my favorite combo is lyle and ben. they play well off each other, and keep the pace moving. This the geeky podcast I listen to without fail. Informative and fun. Strongly recommened! Lyle and Miles make me wish I had two brothers just like them. Lyle is a classic nice person, intelligent and considerate. Miles is very nice too, and seems to be one of the smartest guys on radio. Great podcast - It's fun to listen to and I learn a lot. Sometimes it applies to my world. Sometimes it doesn't. But I like the exposure to the constantly changing tech scene. Been listening for years. Fab podcast. Great moderators. I feel like they are sitting in my home. A bit like Car Talk for Tech. There's a nice balance between all things Tech and it's role in culture. Informative and entertaining. One of my favorite Podcasts since discovering it years ago now!! -Georges L.
These guys are very open to feedback and will admit they do not know it all. (Because who does?) They conduct their discussion in a way that invites listeners who may be an expert in the topic to add to the discussion or in some cases make corrections. I appreciate that they provide information based on the scientific method instead of providing information just because it's trendy or something many hope is a true fact. (like homeopathy). Furthermore, they are also entertaining and humerous (especially crazy USB of the week). Very enjoyable to listen to. I like listening to these guys. They share article about what is new and interesting in the tech world and also answer some listener questions. This is a good podcast to pick up on current or emerging technology in an entertaining way. I don't think they intend the show to be a comprehensive source for tech news, nor should it be taken that way, but it's one more place to hear some of the latest geek scuttlebutt. They seem fair in their comments, not biased or preachy. These guys know a few things but are willing to talk about anything, even if they are incorrect. I stopped listening when he spent five minutes trying to explain a logscale representation of data, poorly, and then the other guy started talking about normal distributions, which is a totally different concept. You can't run a show on science based on a few wikipedia pages. I very much favor tech, security, and "geek" podcasts so it was with eager anticipation that I downloaded and listened to several GeekSpeak podcasts. But after listening to most of the September 12 episode I switched it off in disgust. The hosts deem it fitting to express repeatedly their religious and political leanings. I would not mind if I had downloaded the program to listen to a political debate or religious diatribe but I had expected a technology podcast. To make matters worse the hosts are extremely prejudiced towards anyone with beliefs differing from theirs. I am disappointed as the show has potential to be quite good. These geeks not only know their tech, but also know and explore culture and how tech fits into into it. Informative and entertaining. Can't wait for each episode! This is a great show. Simple enough for the average user while touching on more advanced topics for the serious geek. If you only listen to one tech podcast, GeekSpeak is the one to get. Great show! Keep up the good work Geeks! The best reason to contribute to KUSP is to support this program. Every week is fresh and interesting. I have been listening since it was a 30 minute program on Tuesday evenings and it just gets better! This is a great podcast because I like the guys that are on it. Its a nice way to keep up with the latest news and technologies. As a local here on the Central Coast, I've followed GeekSpeak since its inception, and it just gets better and better. The troubleshooting advice is succinct, but thorough, with great follow-through on posting links to the website. And the geek news and gab is top notch. I learn something useful on this show every week! Very entertaining. I love Geek Speak. I was just messing around on NPR and found a link to it, it is very well done, interesting, and fun to listen to! Tech News for the first half, Answering Tech questions for the second. They do an effective job of both, such that this is a valuable podcast to listen to. I learn a lot just listening to them solve other people's technology problems. There is even some geeky humor, its great! Everyone should listen to this podcast. Technically grounded discussion of timely topics of interest to both general and geek audiences. They don't try to water down the discuss for the non-geek audience but, instead, focus on the practical aspects of technology that you needs to understand in order to use it. Geek speak is just what it says: a couple of California geeks talking about news, talking with guests, or with people calling in with their technical problems. 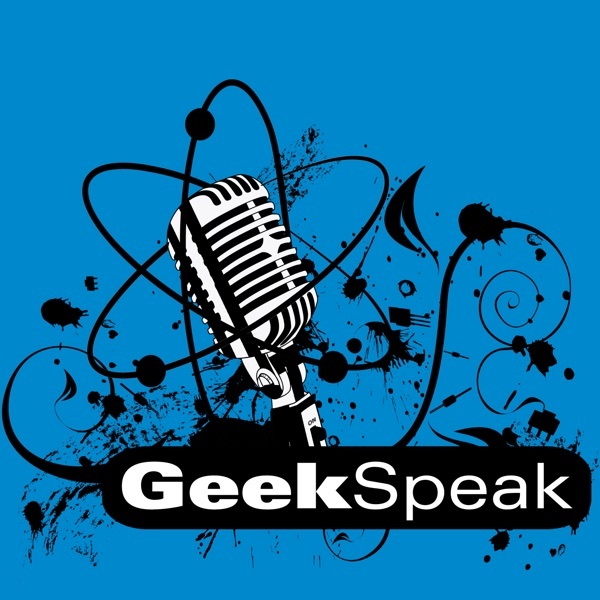 Geek Speak is a pleasure to listen to, not only because of all the geeky goodness, but for the entertainment that they provide. This isn't a dry bunch of guys who talk about about this cable connecting to that port, or how to debug Java. They have a lot of fun with their show. I even get, at least, a few laughs out of it. Even when the subject gets complicated, Lyle and the other geeks do a pretty good job of explaining everything. It's a entertaining way to waste an hour and you might learn something. These guys keep me up on the new info that I dont have time to find on my own in terms that I can pass along to my computer students. But I have asked two questions by email and gotten a response to neither. They do news stories at the begining of every show so yo know what is going on in the tech world. The show is really interesting and fun to listen to whether you are a mega geek or if you just like computers. I would definately recommend this podcast. It does what they say in their opening give geek info to us that aren't, but would like to be. And they do it without being too dry. The podcast lets me listen even though I’m in Chicago. This a great podcast to keep up with. The first half of the show keeps me well informed about various aspects of technology. The hosts are well spoken and I find myself laughing very often. The second half the show in my opinion is targeted toward people with a limited understanding of computers or technology. However I find the solutions that the geeks give to be helpful and have found that people in my life ask me the exact same questions. The guy’s at Geekspeak do an excellent job of covering the basics to advanced topics that any geek or beginner would find useful. I work in Information Technology as a Network Engineer and find their information to be informative and helpful. I enjoy the fact that while they do cover the beginner topics they also get into more advanced topics such as linux, san's, the latest hardware. I really enjoy the pod cast as I live in Detroit Michigan and I can listen to it at my desk at work. Thanks for doing a great job of keeping me informed and entertained. What makes this broadcast and podcast great is that Lyle and company know what they're talking about, and when they don't, they don't fudge it. It's geek-straight-- not cool, not overproduced, not slick in the least... just right. Real Geeks that actually know their stuff!! This is a super Podcast for anyone who is interested in the application of computer and other technology in our everyday world. I have always been unimpressed with other “computer help” type call in programs - not so with GeekSpeak! I always learn new things and look forward to every episode. These guys really know what they are talking about, are not afraid to go a little out on the limb, and always bring a lively and insightful approach to every topic. Tired to trying to talk to the box store saleskids who seldom know more than you do about technology? Can’t stand the pseudo geeks who look back at you with blank stares from behind the counter of your local computer store? These guys will renew your faith in the world of Geeks! The GeekSpeak crew are the Real Thing! Informative and entertaining. The personalities are delightful and compelling. Every week they laughingly GeekSpeak truth to power. There is no better source for pertinant computing information in Podcasting today (that I know of). I drive quite a bit from the Sierra Nevada Mountains to fly out of SFO or LAX, and a huge part of my drive is spent listening to Podcasts. Of the fifteen or so that I subscribe to, Geekspeak is the one I look most forward to, for it's great content. There is just so much information that will help the armchair geek pick stay on top of new advances, solutions to everyday computing issues, and just plain witty banter. Recently, the sound quality has gotten significantly better, while the content remains stellar. Hats off to these guys for providing the most significant content on computing in Podcasting! There are many tech oriented podcasts out there. This is one of the best, with a great mixture of news, call in and featured topic. The podcast is great with a range of topics and guests. Online archives are extensive, and the geeks have been very generous with their time in replying via email to questions submitted in between shows, too. A fantastic resource, give it a couple episodes a try! Since I first stumbled upon this podcast I've been a faithful listener. The show provides not only weekly technology news, but also touches on some of the social implications as our technology advances. Great for aspiring geeks. An excellent show to learn about various computer and internet technology topics. After a quick rundown of current events and sometimes special guest interviews, the show opens up to email and caller questions and comments. There's nothing like having a panel of really smart geeks helping you solve your computer problems by giving you solutions and suggestions. Thanks geeks for a great show.